Snow leopards are very powerful creatures. Silent, stealthy, and shy, these animals are great hunters and runners. Snow leopards mostly live in mountainous lands. They prefer to stay in cold environments, where their long, thick fur protects them from the cold. The big nose of a snow leopard is used to turn the cold air it breathes inward into warm air before it reaches the animal's lungs. Young snow leopards must stay with their mothers until their fur has grown long enough for them to stay warm on their own—usually about two years. Among the mountains, snow leopards' large lungs help them breathe at high altitudes. Also, their long, heavy tails allow them to stay coordinated while hunting, running, and climbing mountain tops. Although snow leopards are small and rarely weigh more than 95 pounds, they are still powerful, majestic creatures. They grow to be around 24 inches tall. As the snow leopard gets older, its black fur spots darken. Snow leopards have adapted to their harsh environment to hunt prey. For example, they use the pads on their feet to help them sneak up on prey and to spring off the ground and lunge at prey. 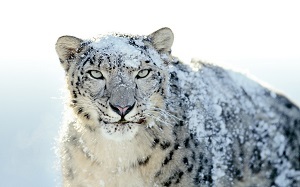 Snow leopards hunt many animals including the ibex goat and long-haired argali sheep. Though adult leopards hunt alone, younger leopards hunt in groups with their siblings and mothers. These mammals have a unique reproductive cycle. Females usually have one to five cubs every two years during their reproductive period. For snow leopards, pregnancy lasts around 90 days. The adult male stays with the mother and cubs for two days after they are born, then he leaves and returns to his solitary ways. Unfortunately, snow leopards are becoming extinct because fur trappers are hunting them and using their fur to make clothing. Another factor limiting the snow leopard population is rising global temperatures that are melting snow and consequentially impacting the animals' habitats. To help protect the snow leopards, the general public can limit pollution by not using products that deplete the ozone and cause global warming. In addition, preventing trapping and poaching with international laws will be needed to help save snow leopards and their habitats. Hopefully, these preventative actions will be effective before it's too late.